Euro ŠKODA cordially invites you and a guest to the official launch of our brand new, state of the art showroom. 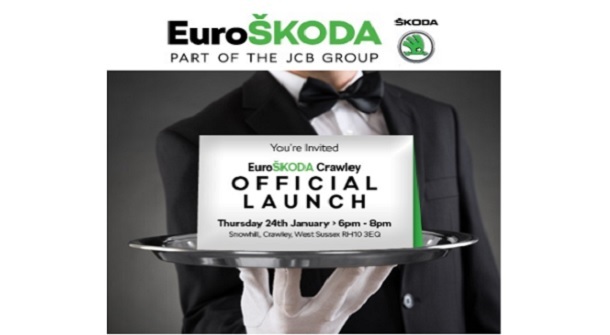 A celebration of all things ŠKODA, join us at Snowhill, Crawley between 6pm and 8pm on Thursday 24th January. Enjoy a glass of fizz and canapés as well as magical entertainment and the chance to browse the fabulous, award-winning ŠKODA range at your leisure. ŠKODA have also gifted us a 'Pot of Gold' allowing us to pass to you huge savings on a new or approved used ŠKODA. That's on top of all current campaign offers including test drive incentives, deposit contributions and free servicing. There will also be an opportunity to enter our prize draw to win a cash prize of £250!